Mentored by music leader Jessie Maryon Davies, four Open Academy Fellows have worked together to devise a new interactive performance piece exploring Key Stage 2 PHSE topics of conflict resolution, inclusion and positive relationships. 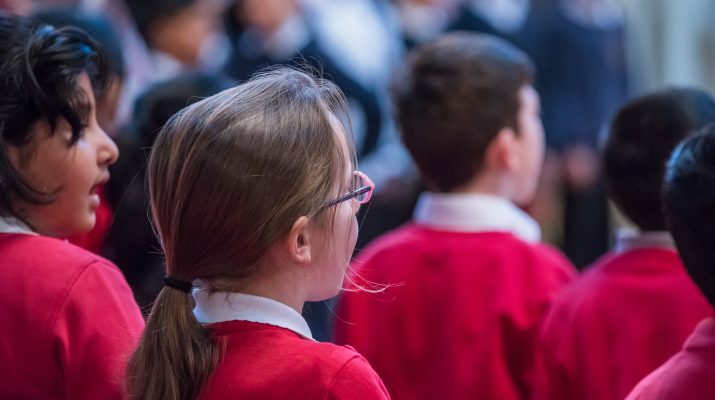 With music by John Cage, Poulenc and Handel, the performance brought to life pre-existing repertoire in a fresh new way for young audiences and was performed to Key Stage 2 audiences in four schools across Tower Hamlets. Year 5 pupils from our Neighbourhood Schools, St Matthias and Canon Barnett primary schools, then worked with the artistic team over four sessions to create their own music and songs in response to the themes and characters in the performance. The two classes shared and discussed their songs with the rest of Key Stage 2, and then travelled to the Royal Academy of Music in March to meet, share and perform their songs to each other and an invited audience of parents and guests.